Once upon a time two cats were walking together in a small village. One of the cats saw a big piece of bread and shouted. The other cat jumped upon and picked the bread. The first cat said, "I am the one who saw the bread, so I should have it." The other cat replied, "So what? I picked it. The bread is mine." The argument continued for a long time without any solution. Finally, they both decided to go to some third person to give a good judgement about this problem. They went to the monkey who lived near to their homes and told him the bread and their fight. The monkey said, "Don't fight. I will share the bread equally among you both". 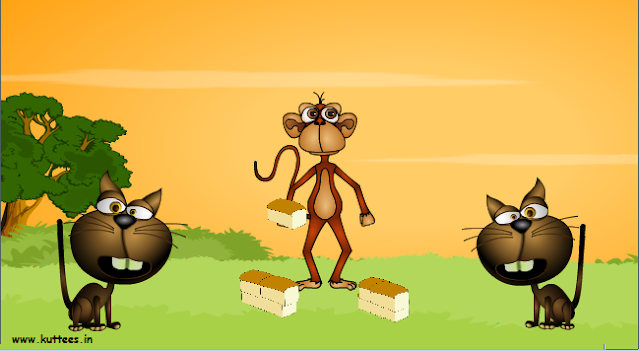 Saying this, the monkey split the bread into two parts. One of that had more bread than the other. The monkey shook his head and said, "Ah.. ah..!! one is bigger than the other". He took some bread from the bigger one and ate the bread. Now the other part looked bigger. So this time he ate some bread from the bigger part. Now the other one appeared bigger and the monkey ate some from this bigger part. Thus he went on eating from one part to the other and finally the monkey ate all the bread. The two cats became very sad. They couldn't eat the bread because of the fight between them. MORAL : When friends fight, bad people will make advantage of that.